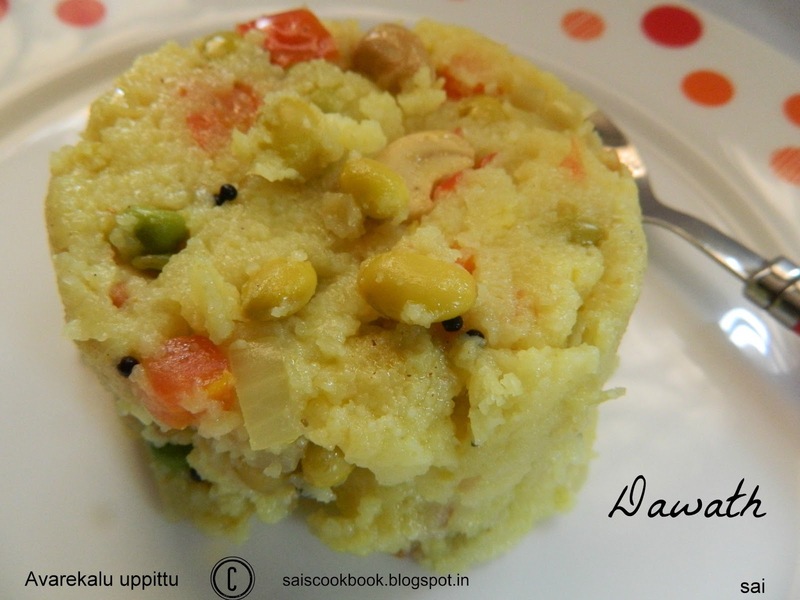 Avarekalu means Lilva beans as in English,Surti papdi as in Hindi and the Kannada name is Avarekalu. Lilva beans is abundant during winter and now we find it Mangalore very easily.When we were kids my Papas sister used to send it across to Mangalore from Shimoga in whole lots during the season since they had, have their own bus(public transport)….It is very famous in Bangalore side.This needs lot of time to separate the bean from the pod.If you want to fry it then there is still more work like soaking the beans overnight and peeling it further which we say Hichkunu in Konkani..As the Hindi dialogue says,Kuch paane ke liya, kuch khona padtha hain ya kuch dena padtha hain and here it is the time….Many dishes can be prepared with this tasty beans,Avarekalu uppittu is a popular breakfast dish in Bangalore of the Kannadigas.I am not aware of the traditional method but this is how we prepare.This recipe and dish was contributed by my bhabhi Santoshi,so I thank her very much. Take a kadai,heat ghee,splutter mustard seeds,urad dal,curry leaves,cashew bits and haldi powder and fry for a minute in simmer. 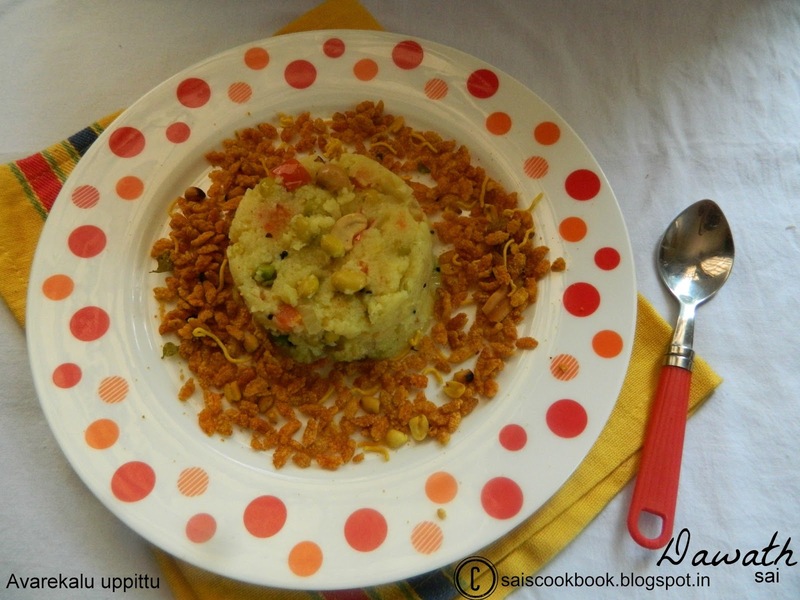 Add onions and fry for 5 minutes,add tomatoes,green chilly,avarekalu, carrots,green peas and water and take a boil. Add salt to taste,sugar,fine rawa and take a boil and simmer and cook until it gets cooked. Cook the lilva beans in cooker for a whistle adding salt. You may store the lilva beans for a year by storing it in the freezer in a ziplock or an airtight container. You may combine veggies of your choice. You may also dry roast the rawa prior or add it without roasting. 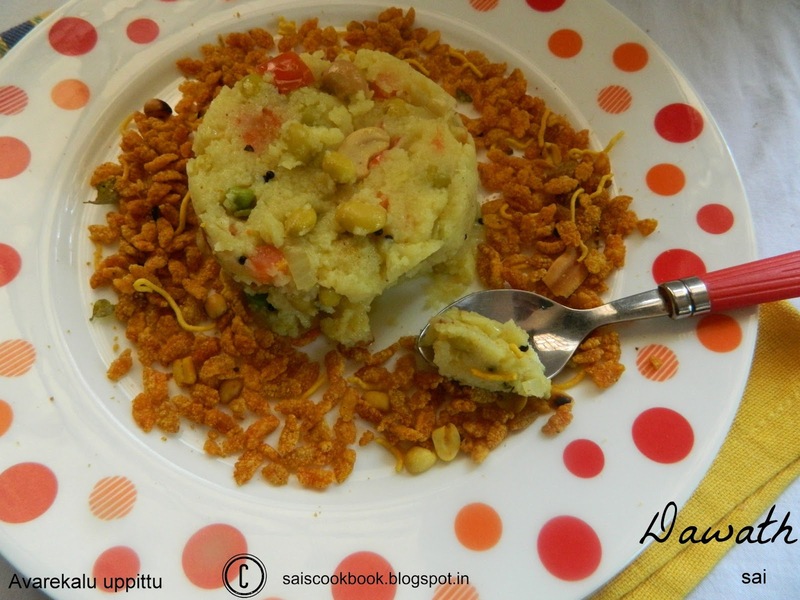 Only if you add generous amount of ghee enhances the taste of any upma,but you may adjust accordingly.